Saturday Night Live star Leslie Jones was born in Memphis and called it home until her dad took a job in Los Angeles. Tall and athletic, Leslie played basketball throughout her high school years and earned an athletic scholarship to Chapman University. However, when her coach at Chapman took a job coaching at Colorado State University, Leslie followed him there. While at Colorado State University, Leslie had her first brush with performing on stage. She delivered a stand-up routine and won the "Funniest Person on Campus" title. After college, she returned to Los Angeles, determined to become a professional comedian. Although she landed a gig opening for Jamie Foxx, stardom didn't come until 1998, when she landed a part as Sergeant Tina Bagley in the Warner Bros. comedy movie Wrongfully Accused , starring Leslie Nielson. She made her television debut with a role as a clerk on the 2000 TV movie Mermaid. The Daytime Emmy-nominated project starred Ellen Burstyn. Leslie made a Canadian TV movie in 2002 called The New Beachcombers before getting wide exposure with the comedy National Security . The 2003 hit starred Martin Lawrence and Steve Zahn. Over the next 10 years, she played small roles in a number of television and movie projects, but it wasn't until 2014 when she joined the cast of Saturday Night Live that she found stardom. Her spot on the iconic show substantially increased her popularity. Also in 2014, she won a part in the comedy Top Five with Chris Rock, Rosario Dawson and Gabrielle Union. The film would go on to earn nominations at the BET Awards and the MTV Movie Awards. 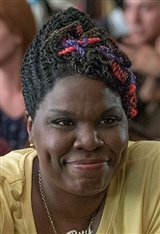 In the 2015 Golden Globe nominated comedy film Trainwreck , Leslie Jones worked alongside star Amy Schumer before offering her voice to the TV series The Awesomes. In 2016, Leslie finally earned the major feature film starring role she dreamed of when she was cast in the female-fueled Ghostbusters . Directed by Paul Feig, the film co-stars Kristen Wiig, Melissa McCarthy and Kate McKinnon. It's an adaptation of the 1984 cult classic of the same name. Later in 2016, Leslie again joined forces with Kristen and Kate in the 2016 comedy Masterminds . Based on one of the biggest bank heists in U.S. history, the film also stars Zach Galifianakis and Jason Sudeikis. She also lent her voice to the character of Ms. Crawl in the animated musical Sing (2016) alongside Matthew McConaughey, Reese Witherspoon, and Scarlett Johansson.